I have been living in a medley of metaphors this year. Reality seems an illusion. Its noise hushed by some mysterious universal rhythm. It is from this transcendent place, which in the past would have caused me great anxiety, I am beginning to discover the life that flows beneath life, the sweet poetry available to each and every one of us on our collective journey to wholeness. I’ve been teaching and co-creating with children around the African philosophy of Ubuntu. Which means, we are each of us brilliantly unique AND we are ONE. And each time I experience the “story circle” that brings this idea to life, I can feel my bones and my heart and my spirit expanding to more fully hold the paradox of the individual and the collective, our difference and our sameness. My brain, on the other hand, is working double time to keep up. 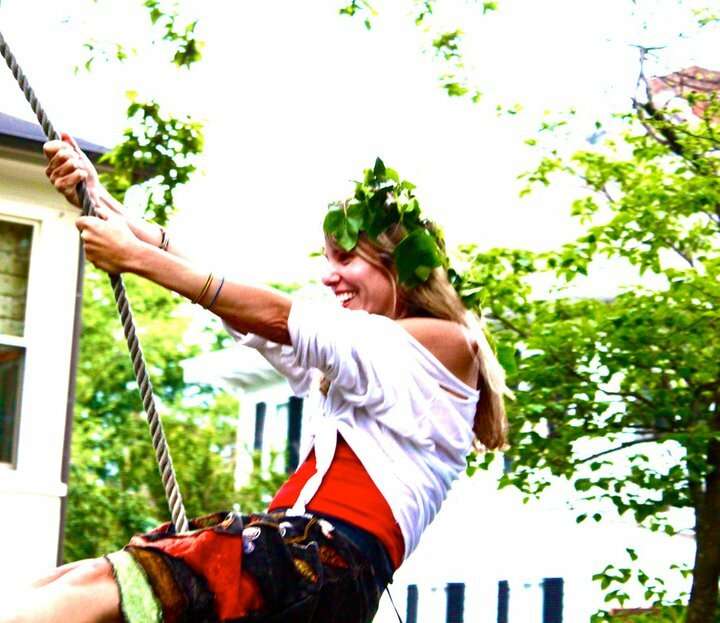 The challenging mental chatter… How can I be in my unique power AND surrender to the simplicity and comfort of oneness? I’ve always been more at home in the ethereal world than in my own body. My energy worker (brilliant alchemist that she is) smiles when she tunes into my chakras. There’s very little going on below my heart, but at the heart and above is big and bold and untamed energy, a lot of it. So my task (one of many on my healing path) is to harness that high vibration and embody it. To redefine power as love and co-create from that human place. Hmmm, what’s a girl living outside of her body to do, but take a whole-hearted leap into some purple (and floral) Doc Martens. Bring some Heaven into my feet. And dance though the hallway of life, not banging down any doors, barely even knocking, just being accessible to possibility. Waiting for a door to open, an invitation to be extended, an opportunity to practice being in my power AND creating oneness with the world. And guess what? It’s working. Somehow though this frivolous shoe metaphor, I am learning to embrace my humanity. To love the messiness of being in a body. To expand my definition of purity (that I always equated with divinity) to include the shame and fear necessary in the organic unfolding of human being. “The house” has a big place in this discovering process, as well. Bear with me as I mix metaphors. We spend the first half of our lives (which, according to Richard Rohr, has nothing to do with age and everything to do with human development) building our identity and putting some thick walls around it to protect it. We tuck shame away in the basement and show the world our pretty faces. Then one day, through some crisis, the house falls down. And we are living among our demons, and scared out of our pants. So, we frantically start to rebuild our house, our identity. Until we find some courage to take a risk, to gently lean into the fear to finally uncover the bliss of true freedom, outside of those walls that we thought defined us and protected us. As we move through the world in this raw and vulnerable way, we have no choice but to name and expose and finally love our personal shame. To admit that evil may exist AND, because we are All of it, we have the capacity to be evil, just as we have the capacity to be pure. And we learn to love each other, not despite our darkness, but because of it. And somewhere on our individual hero’s journeys, we come upon a perpetual campground filled with other people whose houses have fallen down. People who have also entered the second “half” of life, who are dancing the sacred dance TOGETHER. People who have stopped trying to be special and have started to just be. And we understand that we don’t have to build another house. We are already home. I’ve connected with some amazing people on this campground. And experienced the true spirit of oneness. Prayers for Ubuntu answered. I met “Angel” about a year ago. She sits on the rail and takes care of the cats. She has no home (literally), yet she is always joyful and grateful and kind. Our encounters have been serendipitous, filling each other with the necessary comforts of real time and the necessary wisdom of REAL time. Last week, we went to an RV lot to explore the possibility of a home for Angel. I went in a bit blind, without the important information I really needed to act as her advocate. My husband’s caution ringing in my head, I ignored it, choosing to let Love lead. And lead it did. We were greeted by a woman at the shop who was busy preparing for the big RV show at the fairgrounds. Her humanity took up the whole room. She introduced herself as Shelby and then apologized for her shoes (she was trying to break them in and evidently she didn’t think they went with her outfit). I directed her attention to my purple floral boots, which certainly didn’t “go” with my outfit either—but did “go” with my personality. She liked that. Shelby shook Victoria’s hand, looked her in the eye, and said, “How can I help?” Victoria handed her an ad from 2011 for a very reasonably priced used RV. Shelby smiled and said how honored she was that Victoria had held on to the ad for so long. Then to Angel’s obvious disappointment and embarrassment, Shelby said she no longer had RVs in that price range. Back in the office, Shelby ran some numbers. She completed a loan application. She called her personal banker to ask questions.. She held us with compassion and respect…and a deep and sacred sense of our shared humanity. 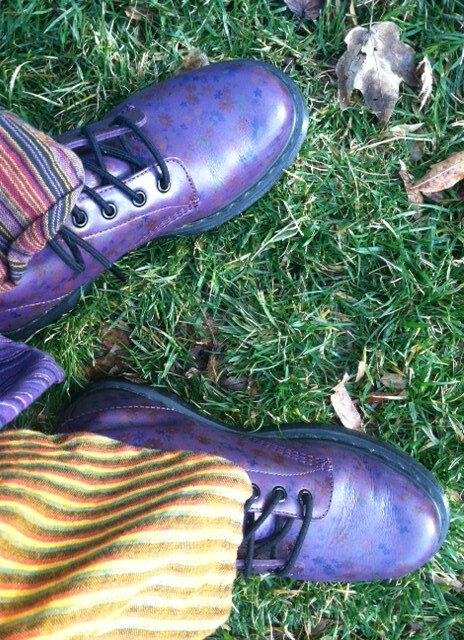 Ahhh, what is possible when we stand in our purple boots, in our unique power AND in our sameness, our oneness! A parting metaphor as my mind still struggles to hold the paradox of power and surrender. We are in a canoe, together. I am in yours. You are in mine. We are flowing through the river of innocence. So in tune with the ALL of it, with the life beneath life. We know when to exert our will, when to row; and we know when to be still and let the river hold us. We are in the flow of life. Embraced by the mystery. Living Ubuntu. Living Love. Together. Nicki Peasley is a student of life and a teacher of love. In the past, she developed curricula and worked (played and learned and told stories) with elementary and middle school youth. Now, she is living in the question of what’s next. Perhaps just being human is more than enough.